Origin: Found along the northwestern coast of Mexico from Sonora to Chihuahua States. Habitat: This is a snake of open grasslands, old pastures and fields in relatively dry lowlands. 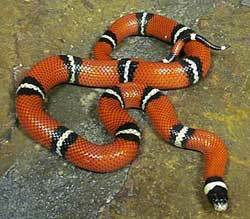 A big, beautiful milk snake, this is one of the most popular snakes for beginning keepers because it is so easy to care for. Specimens must be kept singly because of the risk of a larger snake eating a smaller one, as is the case for all Lampropeltis species. Sinaloan milk snakes are sedentary, and even a large adult can be comfortably housed in a 20-gallon terrarium or plastic box with a substrate of shredded aspen or similar bedding that helps maintain a moderate humidity. Provide a large water bowl and change the water regularly. Specimens do well at temperatures, between roughly 75 and 85 degrees Fahrenheit, and doesn’t need a temperature drop at night. An undertank heating pad in one corner of the terrarium should be set to hold a temperature of 90 degrees. Although they don’t really need it, many specimens will learn to bask under a weak basking lamp. Most specimens are easy to handle, but some are nervous and can be nippy, so be careful. Even hatchling Sinaloan milk snakes are easy to feed, taking small mice a few days after hatching. Large adults will take adult mice and even small rats. Feed once or twice a week. In nature the species is largely nocturnal, but captive-bred specimens will take food at any hour. Be prepared to wipe feces off glass surfaces, as these snakes can be messy. Almost all specimens offered for sale are captive-bred over many generations. Several color varieties are available.